Type 2 diabetes mellitus is the result of impaired systemic control of glucose homeostasis, in part through the dysregulation of the hormone glucagon. Glucagon acts on the liver to increase glucose production through alterations in hepatic metabolism, and reducing the elevated glucagon signalling in diabetic patients is an attractive strategy for the treatment of hyperglycaemia. Here we review the actions of the hormone in the liver, focusing on the acute alterations of metabolic pathways. This review summarises a presentation given at the ‘Novel data on glucagon’ symposium at the 2015 annual meeting of the EASD. It is accompanied by two other reviews on topics from this symposium (by Mona Abraham and Tony Lam, DOI: 10.1007/s00125-016-3950-3, and by Young Lee and colleagues, DOI: 10.1007/s00125-016-3965-9) and an overview by the Session Chair, Isabel Valverde (DOI: 10.1007/s00125-016-3946-z). The pancreatic hormone glucagon has long been recognised as the major hormonal positive regulator of systemic glucose production and the predominant counterbalance to insulin in the control of glycaemia; together these two hormones represent the organism’s main output function for the governance of circulating glucose levels. Following decades during which reduced insulin action was viewed as the exclusive cause of diabetes mellitus and hormonal replacement proved transformative to diabetic individuals worldwide, renewed interest in glucagon has resulted in a rediscovered appreciation of the role this hormone plays in the pathophysiology of impaired glucose homeostasis [1, 2, 3]. 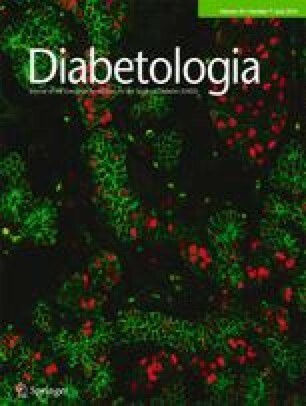 This recent excitement for glucagon antagonism as a viable therapeutic approach stems from the tantalising preclinical results suggesting that reducing glucagon action or secretion will exert potent reductions in the elevated hepatic glucose production present in both type 1 and 2 diabetes mellitus [4, 5, 6, 7, 8]. Glucagon is secreted by the pancreatic alpha cell in response to changes in the local concentration of glucose, amino acids or insulin. Once in circulation it exerts its endocrine effects on the liver through activation of the glucagon receptor (GCGR), a G protein-coupled receptor (GPCR), and engagement of the Gαs and β-arrestin pathways. Glucagon ultimately stimulates an increase in the export of glucose from the liver—the result of enhanced glycogenolysis and gluconeogenesis [9, 10, 11, 12]. The intracellular effects of glucagon in the hepatocyte are complex, but most or possibly all result from activation of adenylate cyclase, intracellular production of cAMP and subsequent activation of protein kinase A (cAMP-dependent protein kinase, PKA). Controversy remains regarding the relative importance of the acute metabolic and more long-term transcriptional actions of glucagon, but there is little doubt of the robust increase in the transcription of cAMP response element binding protein (CREB) target genes whose protein products are at potentially crucial points in the gluconeogenic pathway . Nonetheless, despite robust effects of glucagon on transcriptional control, in this review we will focus on the direct post-translational effects of glucagon on hepatic metabolism, which we favour as the primary physiological site of glucagon action for two reasons. First, the magnitude of glucagon-dependent changes in gene expression and cellular levels of metabolic enzymes under normal physiological conditions is unlikely to exert a profound influence on gluconeogenic fluxes. This has been most clearly demonstrated through an allelic series of the Pck1 gene, encoding the gluconeogenic enzyme phosphoenolpyruvate carboxykinase (PEPCK). In experiments performed ex vivo in perfused liver, levels of PEPCK protein did not correlate well with gluconeogenic fluxes . Second, glucagon-dependent changes in systemic and hepatic metabolism occur too rapidly to be mediated by transcriptional events. Early studies of glucagon effects on metabolism concluded that the increase in lactate-derived glucose in rat liver perfusions could be seen within about 90 s of introducing the hormone into the perfusion medium . However, it remains likely that under some conditions transcriptional regulation drives meaningful changes in hepatic metabolism, most probably after prolonged fasting or in a setting of chronic hyperglucagonaemia such as diabetes. Studies of glucagon action in rodent liver performed nearly 50 years ago remain central to the understanding of the impact of the hormone on hepatic metabolism. Early studies defined the primary physiological actions of glucagon as acute increases in both glycogenolysis and gluconeogenesis, occurring in the time frame of seconds to minutes [9, 10, 11, 12], but a deep understanding of the metabolic phenomena awaited a pioneering set of work performed at Vanderbilt University by Exton and Park [15, 16, 17]. This work, published in a series of papers in the Journal of Biological Chemistry, used enzymatic methods to quantify intracellular metabolites in livers perfused with increasing concentrations of lactate and pyruvate. The accumulation of metabolites defined the steps in the gluconeogenic pathway that were most limiting for metabolic flux, i.e. under basal conditions a step that occurs after the production of pyruvate but prior to the production of phosphoenolpyruvate (PEP). Exton and Park performed parallel experiments evaluating the impact of glucagon on the levels of intracellular metabolites in the gluconeogenic pathway, focusing on the intermediates in lactate-derived gluconeogenesis. These so-called crossover analyses of the gluconeogenic pathway identified the steps where a hormone treatment caused a change in the apparent rate-limiting metabolic step, suggesting that a major control point of glucagon regulation of gluconeogenesis occurs between pyruvate and PEP. This step includes the actions of pyruvate carboxylase (PC), export of oxaloacetate from the mitochondria as either malate or aspartate and the cytoplasmic production of PEP, and could be impacted by PEP removal through the action of pyruvate kinase (PK). The subsequent decades of research on glucagon action would focus on the identification of protein substrates of PKA that could explain these results. Much of the impact of glucagon action on hepatic metabolism can now be explained through PKA-catalysed regulatory phosphorylation events that affect the activity of three important enzymes: phosphorylase kinase (PhK), pyruvate kinase (PK), and phosphofructokinase 2 (PFK-2) [18, 19, 20, 21]. The actions of PKA on these enzymes result in a dramatic shift in hepatic metabolism, changing it from a state that supports futile cycling in glycolysis and glycogenesis to one that rapidly suppresses metabolite cycles and results in the net flux of glucose output from the liver. Hepatic glycogen stores are rapidly mobilised when plasma levels of glucagon are elevated, resulting in a nearly immediate increase in hepatic glucose output. This effect is mediated by PKA phosphorylation and activation of PhK, which phosphorylates and activates glycogen phosphorylase . This effect not only reduces the capacity of the liver for rapid storage of prandial glucose but also diverts gluconeogenesis-derived glucose from being stored as glycogen, releasing it into the plasma instead. This action of glucagon is likely to be the most important to its role as a counter-regulatory hormone capable of participating in the defence against acute hypoglycaemia, as it allows rapid hormone-controlled access to the latent glucose stored as hepatic glycogen. PKA-dependent phosphorylation of the two primary glycolytic targets of glucagon signalling, pyruvate kinase and PFK-2, which is the bifunctional enzyme 6-phosphofructo-2-kinase/fructose-2,6-bisphosphatase, results in the cessation of futile operation of both gluconeogenic and glycolytic flux by suppressing glycolysis, resulting in a rapid increase in the net metabolic flux in the gluconeogenic direction. For bifunctional enzyme PFK-2, this is accomplished by phosphorylation-induced activation of the fructose-2,6-bisphosphatase activity of the enzyme and inhibition of 6-phosphofructose 2-kinase activity, causing the rapid reduction of the second messenger metabolite fructose-2,6-bisphosphate . Fructose-2,6-bisphosphate exerts its allosteric effects on phosphofructokinase 1 (PFK-1), promoting glycolytic over gluconeogenic flux; glucagon promotes a reduction in fructose-2,6-bisphosphate that causes a rapid decrease in the rate of glycolysis and an increase in the rate of gluconeogenesis. PKA phosphorylation of pyruvate kinase decreases its activity, resulting in a reduction in futile pyruvate cycling whereby PEPCK-derived PEP is dephosphorylated to regenerate pyruvate rather than contributing to gluconeogenesis . The consequence of these hepatic actions of the glucagon–cAMP–PKA signalling pathway is a rapid increase in gluconeogenesis through the termination of concomitant gluconeogenic and glycolytic enzymatic activities. The establishment of a new balance of metabolic activities in the liver is likely to be a more significant contributor to elevated gluconeogenesis than increases in gluconeogenic enzymes content, especially under submaximal physiological gluconeogenic substrate concentrations that would be less likely to expose defects in the V max of gluconeogenic enzymes. Glucagon’s impact on hepatic metabolism extends beyond a direct effect on gluconeogenesis to include a more concerted enhancement of amino acid catabolism for use as gluconeogenic precursors. This serves a physiological need in that matching increased hepatic utilisation of amino acids is a mechanism to input new carbon into the glucose–lactate Cori cycling during a time of fasting. The observation that high-protein meals stimulate both insulin and glucagon secretion reveals a typical coordinated physiological response, in this case designed to drive the synthesis of glucose for peripheral tissue consumption . The impact of glucagon on amino acid catabolism can clearly be seen in human conditions of hyperglucagonaemia, which are associated with muscle wasting, and by the increases in lean body mass observed in genetic rodent models of reduced glucagon signalling [23, 24, 25, 26]. Pharmacological inhibition of glucagon signalling also rapidly alters amino acid levels in preclinical species; studies of glucagon antagonism in non-human primates have shown alterations in the transcriptional program for amino acid uptake and metabolism accompanied by changes in many circulating amino acids . Given the known role of amino acids in triggering the secretion of glucagon from the alpha cell, the elevated amino acids following glucagon antagonism may also contribute to the associated hyperglucagonaemia. At the cellular level, glucagon stimulates a programme in hepatocytes that elevates the rate at which amino acids are transported and metabolised, although the exact mechanisms of these effects remain to be fully characterised. Glucagon has been shown to stimulate amino acid transporters, both the system A and system N transport pathways, which account for the import of the primary gluconeogenic amino acids alanine and glutamine, respectively [27, 28, 29]. Glucagon also increases the catabolism of multiple amino acids, including the deamination of glutamine, a rapid effect that is likely to contribute to the increased ureagenesis observed in response to glucagon [30, 31, 32]. Glucagon is also capable of increasing the activities of serine metabolising enzymes, altering the intracellular metabolic fate of serine; conversely, antagonism of glucagon causes a rapid and large decrease in the key serine hydrolysing enzyme, serine dehydratase [6, 33, 34]. These concerted actions of glucagon to increase the uptake and utilisation of amino acids as catabolic fuel helps to provide anaplerotic and gluconeogenic substrates that are necessary during fasting or at times during which increased glucose synthesis is required. Gluconeogenic flux is tightly coupled with the rate of respiration and ATP production ; glucagon increases mitochondrial oxygen consumption, consistent with the notion that an increase in energy production is required for glucagon’s stimulation of gluconeogenesis [36, 37, 38]. One of the ways in which glucagon stimulates mitochondrial respiration is through increased intracellular and mitochondrial calcium levels [39, 40, 41]. This is accomplished by both enhanced cellular calcium uptake and release of intracellular calcium stores from the endoplasmic reticulum (ER). The latter occurs in part through the PKA-dependent phosphorylation of the inositol 1,4,5 trisphosphate receptor (IP3R), resulting in calcium release at lower concentrations of IP3 . IP3R-mediated calcium release from the ER is specifically directed to the mitochondria because of the proximity of mitochondria to the ER membrane . Elevations in mitochondrial calcium significantly influence metabolism by increasing the rates of key reactions in the tricarboxylic acid (TCA) cycle and in electron transport, including those catalysed by pyruvate dehydrogenase, isocitrate dehydrogenase, and α-ketoglutarate dehydrogenase [44, 45, 46]. Increases in mitochondrial calcium may have other effects, such as those on the rate of transport of metabolites and adenine nucleotides, which may also affect gluconeogenesis [47, 48, 49]. Calcium-mediated increases in mitochondrial TCA cycle flux and substrate transport may prove to be an underappreciated site of action for glucagon in its regulation of hepatic glucose metabolism. Pharmacological GCGR antagonism has been shown in preclinical studies to be an effective treatment for the elevated hepatic glucose output that characterises the diabetic state [5, 6, 7, 8]. The positive results of these preclinical studies have begun to translate into clinical impact, with impressive glucose lowering with small molecule glucagon receptor antagonists in diabetic individuals [4, 50]. This demonstrates the contribution increased glucagon signalling makes to the diabetic state and the potential for large effects on glycaemia with antagonism. The relative contributions the downstream metabolic pathways described above make to clinical efficacy remain to be determined. From preclinical work it is clear that glucagon antagonism can lower plasma glucose within 1 h of compound dosing ; the rapidity of the response argues against a transcriptional mechanism for the glucose lowering because of the time required for mRNA and protein decay. Preclinical studies have reported that antagonism of glucagon signalling is capable of elevating plasma amino acid levels, presumably by lowering hepatic consumption—the relative importance of this effect towards the systemic efficacy is unclear . The contribution of distinct glucagon effects to clinical efficacy and safety will be an important area of research as this therapeutic mechanism is investigated further. There have been no recent advances in glucose-lowering therapies targeting the liver despite the widespread appreciation that elevated hepatic glucose output in diabetic individuals is a primary cause for elevated systemic glucose levels during fasting. The renewed appreciation that hyperglucagonaemia is an underlying cause of the excess hepatic glucose production in diabetes has increased the likelihood that small or large molecule therapies targeting this pathway will prove beneficial to patients. Years of study have highlighted those intracellular events occurring upon glucagon simulation that are likely to impact glucose output: glycogen breakdown through phosphorylation of PhK, increased gluconeogenesis through phosphorylation of PFK-2, PK and CREB (Fig. 1). However, numerous experiments have also identified additional metabolic actions of glucagon that are a part of its conserved role as a regulator of fasting biology. These include its ability to promote amino acid catabolism and mitochondrial TCA flux through increased calcium levels. These actions have the potential to contribute meaningfully to efficacy or safety profiles in the setting of glucagon antagonism. Further work is required to determine the physiological significance of these additional actions of glucagon and their impact in the setting of diabetes.